Rudy Galindo's life story of joy, heartbreak and triumph over adversity is legendary in the skating world, and he's seen as a Latino and LGBT pioneer. SAN JOSE, California – Throughout his childhood and adolescence, figure skating was a way for Rudy Galindo to escape his hardscrabble upbringing and dysfunctional home life. As a young man, he medaled in national and world championships, becoming America’s most decorated Latino figure skater and a pioneer for LGBT athletes. 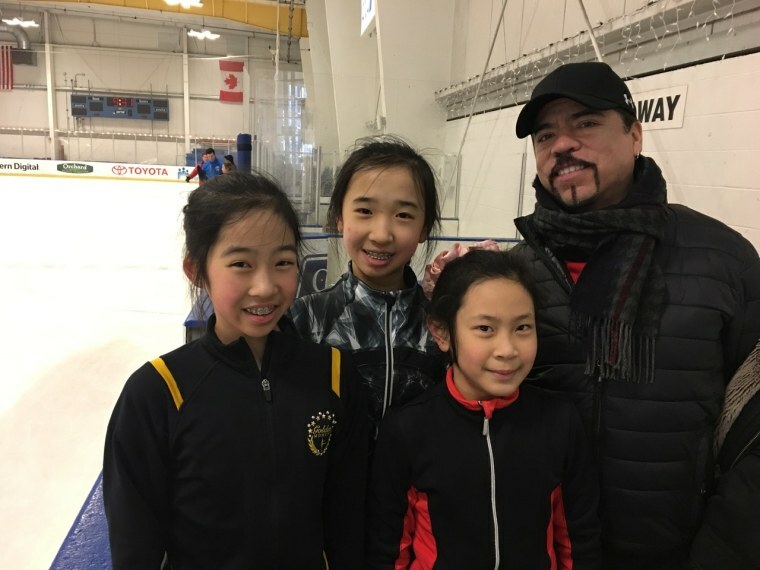 Now with the eyes of the world on the skating events at the Pyeongchang Olympics, Galindo is still making his mark on the sport he loves, coaching and nurturing a new generation of hopeful skating champions. At 7:30 in the morning at the cavernous Solar4America Ice at San Jose complex, Galindo, 48, has already been on the ice for several hours. Swathed in a heavy parka and a thick scarf, he watches one of his students practice her moves. “We have to work on your axel, those are big points,” he calls out. “Good! Now do one more!” As a dozen skaters practice their routines, the frosty air is filled with the sound of blades skimming over the ice. While coaching is the latest chapter in Galindo’s life, over the years he has experienced spectacular professional highs and devastating personal lows. His life story of joy, heartbreak, and triumph over adversity is legendary in the skating world. Of Mexican-American descent, Galindo was born in the working-class neighborhood of East San Jose. His childhood was far from idyllic. His family lived in a trailer, his truck driver father was on the road for long stretches and his mother suffered from bouts of mental illness. Galindo found his escape on the ice, where his older sister was taking skating lessons at a local rink. Before long, Rudy was taking lessons too, and participating in local competitions. Galindo even lived with Yamaguchi’s family for several years so that they could focus on their training; a typical day found them training for 6 to 8 hours, and doing their homework in the backseat of Kristi’s mother’s car as she drove them to practice sessions. “Rudy was like my brother,” Yamaguchi recalled. As a duo, Galindo and Yamaguchi won the U.S National Championships (Junior Pairs) in 1986, the World Junior Championships in 1988, and the U.S. National Championships in 1989 and 1990. But soon Yamaguchi, who had been juggling both pairs and solo skating, decided to concentrate on her solo efforts. Her professional break with Galindo left him devastated and unfocused. “That was a tough time for him,” said Ann Killion, sports columnist for the San Francisco Chronicle. “Rudy kind of got left behind, and Kristi was moving into her own spotlight, and then on to the Olympics.” His sense of loss was compounded by his father’s passing, and the deaths of two of his coaches and his older brother from HIV/AIDS. After an uneven period as a skater — during which time he considered quitting the sport altogether — Galindo pulled off a surprise victory at the 1996 U.S. National Championships, which were held in his hometown of San Jose. According to Cyd Ziegler, co-founder of OutSports.com, Galindo was a pioneer for LGBT athletes. “Rudy being a trailblazer for other athletes, and on social justice issues, is paramount to his legacy,” he said, noting that Galindo is one of the few athletes to come out while still active in his sport. “Some athletes don’t want to come out because they don’t want to be known as ‘the gay football player,’ or ‘the gay basketball player.’ The fact that Rudy was willing to take on this mantle is a powerful statement about him as a human being,” said Ziegler. His titles aside, Galindo can doubly claim to rank among the U.S. figure skating elite. First, he is part of a legacy of Bay Area skaters, including Peggy Fleming, Brian Boitano, Debi Thomas, and Kristi Yamaguchi, that achieved great success. Second, he competed in what is widely regarded as a golden age for U.S. figure skating. Among his 1996 U.S. world teammates were Michelle Kwan, Tara Lipinski, and Todd Eldredge. Galindo released his autobiography, Icebreaker, in 1997. Galindo was inducted in to the U.S. Figure Skating Hall of Fame in 2013. He is currently featured in a special edition of People Magazine entitled The Best of Olympic Figure Skating. These days, Galindo stays busy with his students, who range from age 7 to 17, and include Ava Stephens, 13, who competed in the intermediate women’s division at the U.S. Figure Skating Championships last month.